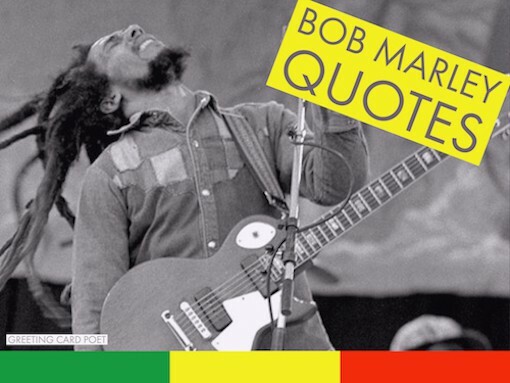 These Bob Marley quotes capture some of the thoughts and insights from the Jamaican singer-songwriter. Born in 1945 and passed away in 1981, Marley only lived 36 years. And, yet, his stamp on modern culture is still going strong. He popularized reggae and the Rastafari movement around the world. 1.) Enjoy life now. This is not a rehearsal. 2.) Keep calm and chive on. 3.) Don’t worry about a thing, every little thing is gonna be alright. 4.) Though the road’s been rocky, it sure feels good to me. 5.) Don’t gain the world and lose your soul, wisdom is better than silver or gold. 6.) One love, one heart. Let’s get together and feel all right. 7.) Love would never leave us alone. 8.) Only once in your life, I truly believe, you find someone who can completely turn your world around. You tell them things that you’ve never shared with another soul and they absorb everything you say and actually want to hear more. 9.) The biggest coward is a man who awakens a women’s love with no intention of loving her. 10.) What important is man should live in righteousness, in natural love for mankind. 11.) Being vulnerable is the only way to allow your heart to feel true pleasure. 12.) The winds that sometimes take something we love, are the same that bring us something we learn to love. 13. )The biggest coward of a man is to awaken the love of a woman without the intention of loving her. 14.) They told me that to make her fall in love I had to make her laugh. But every time she laughs I’m the one who falls in love. 15.) The greatness of a man is not in how much wealth he acquires, but in his integrity and his ability to affect those around him positively. 16.) If you can love the wrong person that much, imagine how much you can love the right one. 17.) 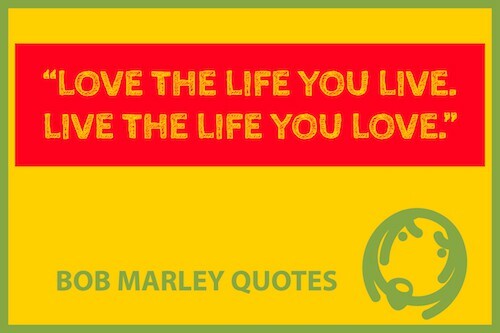 Love the life you live, live the life you love. 18.) She may not be the most popular or prettiest, but if you love her and she makes you smile.. what else matters? 19.) Don’t analyze. Smile when he makes you happy, yell when he makes you mad, and miss him when he’s not there. Love hard when there is love to be had. Because perfect guys don’t exist, but there’s always one guy that is perfect for you. 20.) If puss and dog can get together, why can’t we love one another? 21.) One love, one heart, one destiny. 22.) Some will hate you pretend they love you now then behind they try to eliminate you. 23.) There will never be no love at all. 24.) You may not be her first, her last, or her only. She loved before she may love again. But if she loves you now, what else matters? 25.) We should not cry about something that was taken from us, but, yes, love what we have been given. Because what is really ours is never gone forever. 26.) Overcome the devils with a thing called love. 27.) Light up the darkness. 28.) Live for yourself and you will live in vain; live for others and you will live again. 29.) Forget your troubles and dance. 30.) Some people feel the rain. Others just get wet. 31.) Open your eyes, look within. Are you satisfied with the life you’re living? 32.) When one door is closed, don’t you know, another is open. 33.) One good thing about music, when it hits you, you feel no pain. 34.) You entertain people who are satisfied. Hungry people can’t be entertained – or people who are afraid. You can’t entertain a man who has no food. 35.) Tell the children the truth. 36.) I went deep inside myself. I had time to explore my beliefs and because of that I’m stronger. 37.) Put your vision to reality. 38.) My music fights against the system that teaches to live and die. 39.) You have to be someone. 40.) Man is a universe within himself. 41.) My fear is my only courage. 42.) The mind replays what the heart can’t delete. 43.) Forget how much it hurts and try again. 44.) When you smoke the herb, it reveals you to yourself. 45.) You can’t find the right roads when the streets are paved. 46.) Don’t forget your history nor your destiny. 47.) My future is righteousness. 48.) Money can’t buy life. 49.) Free speech carries with it some freedom to listen. 50.) When the root is strong, the fruit is sweet. 51.) Judge not, before you judge yourself. 52.) In the abundance of water a fool is thirsty. 53.) If something can corrupt you, you’re corrupted already. 54.) I wish money didn’t make us who we are. I just wish we could redo society. 55.) The truth is, everyone is going to hurt you. You just got to find the ones worth suffering for. 56.) Just because you are happy, it does not mean that the day is perfect, but that you have looked beyond its imperfections. 57.) Road of life is rocky and you may stumble too, so while you talk about me, someone else is judging you. 58.) I will never regret you or say I wish I’d never met you, because once upon a time, you were exactly what I needed. 59.) Better to die fighting for freedom than be a prisoner all the days of your life. 60.) Everything is political. I will never be a politician or even think political. Me just deal with life and nature. That is the greatest thing to me. 61.) You never know how strong you are until being strong is the only choice you have. 62.) Beginnings are usually scary, and endings are usually sad, but it’s everything in between that makes it all worth living. 63.) Emancipate yourselves from mental slavery. None but ourselves can free our minds. 64.) Money is numbers and numbers never end. If it takes money to be happy, your search for happiness will never end. 65.) Who are you to judge the life I live? I know I’m not perfect — and I don’t live to be — but before you start pointing fingers, make sure your hands are clean! 66.) When one door is closed, don’t you know that many more are open. 67.) Prejudice is a chain, it can hold you. If you prejudice, you can’t move, you keep prejudice for years. Never get nowhere with that. 68.) Life is one big road with lots of signs. So when you riding through the ruts, don’t complicate your mind. Flee from hate, mischief and jealously. Don’t bury your thoughts, put your vision to reality. Wake up and live! 69.) The day you stop racing, is the day you win the race. 70.) You just can’t live in that negative way, make way for the positive day. 71.) The good times of today, are the sad thoughts of tomorrow. 72.) Being vulnerable is the only way to allow your heart to feel true pleasure. 73.) If you get down and quarrel everyday, you’re saying prayers to the devil, I say. 74.) And don’t expect more than she can give. Smile when she makes you happy, let her know when she makes you mad, and miss her when she’s not there. 75.) Get up, stand up, Stand up for your rights. Get up, stand up, Don’t give up the fight. 76.) Never expect God to do for you what you don’t do to others. 77.) Truth is the light, so you never give up the fight. 78.) Every man got the right to decide his own destiny. Both a religion and a social movement, Rastafari or Rastafarianism, owes some of its increased awareness to Bob Marley. Marley converted from Christianity to the Rastafari Movement in the late 1960s. Learn more about Rastafari. 79.) He’s not perfect. You aren’t either, and the two of you will never be perfect. But if he can make you laugh at least once, causes you to think twice, and if he admits to being human and making mistakes, hold onto him and give him the most you can. 80.) Only once in your life, I truly believe, you find someone who can completely turn your world around. You tell them things that you’ve never shared with another soul and they absorb everything you say and actually want to hear more. 81.) It’s your own conscience that is gonna remind you; that it’s your heart and nobody else’s that is gonna judge. 82.) Until the end of the world, all whys will be answered, but now, you can only ask! 83.) They say: only the fittest of the fittest shall survive, stay alive! 84.) The people who were trying to make this world worse are not taking the day off. Why should I? 85.) You can fool some people sometimes but you can’t fool all the people all the time. 86.) I don’t stand for black man’s side, I don’t stand for white man’s side, I stand for God’s side. 87.) Herb is the healing of a nation, alcohol is the destruction. You’re on Bob Marley quotes. You might like the following.